In December, Travis Kelce, a 2008 Heights High graduate and tight end for the Kansas City Chiefs, was named a starter in the 2017 National Football League (NFL) Pro Bowl, to be played this Sunday, Jan. 29, 8 p.m., in Orlando, Fla. This will be Kelce’s second appearance in the Pro Bowl. On Jan. 23, his older brother, Jason Kelce, joined him on the 2017 Pro Bowl roster. Jason is also a Heights High grad, and plays center for the Philadelphia Eagles. This will be Jason Kelce’s second Pro Bowl appearance; he was previously selected for the 2015 roster. At the University of Cincinnati, Jason played several positions on the offensive line, and the Eagles drafted him in the sixth round of the 2011 NFL Draft. At Heights High, Jason played both as a running back and linebacker, and was twice named to the All-Lake Erie League. At Height High, Travis was a standout in multiple sports, and was an All-Lake Erie League quarterback. 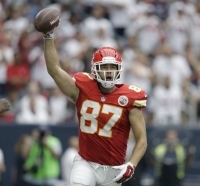 Like his brother, Travis attended the University of Cincinnati, where he played as a tight end for three seasons before Kansas City selected him in the third round of the 2013 NFL Draft. Sidelined by an injury his first year as a pro, Kelce become the Chiefs' leading receiver, earning his way to the Pro Bowl in both 2016 and 2017. During the pre-recorded player introductions that are part of many televised NFL games, Travis Kelce always gives a shout-out to Cleveland Heights, naming his hometown in lieu of naming the college he attended. Kathleen Fant is the bookkeeper for FutureHeights. She and her husband, John, are avid football fans and proud Cleveland Heights residents.